Many wearers feel that contact lenses show their eyes in a better light of don't like the appearance of eyeglasses. Better vision correction due to the reduced obstruction form eyeglass frames. What are the disadvantages of wearing contact lenses? Except for some disposable varieties, almost all lenses require regular cleaning and disinfection, a process that, although requires only a few minutes, is more than some people want to undertake. Some types of lenses increase your eye' sensitivity to light. For those involved in sports and recreational activities, contact lenses have a number of advantages. In addition to providing good peripheral vision, eliminating the problem of fogged or rain splattered lenses, and freeing you from worries about broken glasses, contact lenses also mean you can wear non-prescription protective eye wear. Looking sideways through the lenses of glasses leads to prismatic effects because you are not looking through their centers. Your eyes have to coordinate differently to cope with this. This does not happen with contact lenses because you always look through the centers of the lenses as they move with your eye movements. Your occupation and work environment should also be taken into consideration. 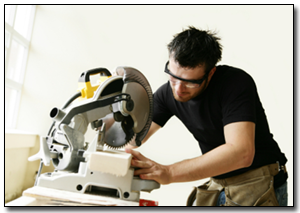 People whose work requires good peripheral vision may want to consider contacts. Those who work in dusty environments or where chemicals are in heavy use are likely to find spectacles more comfortable. Do you like the way glasses feel? Do you like how you look in them? No longer is it really necessary to choose between either contacts or glasses. Some of today's contacts are so easy to wear that you can use them intermittently, for special occasions, while participating in sports or to match your fashions. 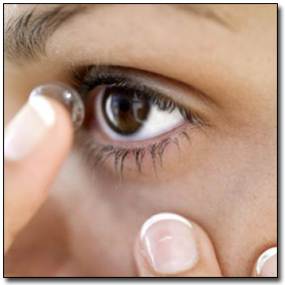 Contact lenses are designated to rest on the cornea, the clear outer surface of the eye. They are held in place mainly by adhering to the tear film that covers the front of the eye and, to a lesser extent, by pressure from the eyelids. As the eyelid blinks, it glides over the surface of the contact lens and cause it to move slightly. This movement allows the tears to provide necessary lubrication to the cornea and the contact lens. When in place on the cornea, the contact lens functions as the initial optical element of the eye. The optics of the contact lens combined with the optics of the eye to properly focus light on the retina. The result is clear vision.